Sarah is our host at Allsorts this week and would like to see cards 'For the Guys' our sponsors are Cuddly Buddly and Digistamp Boutique. So it seems only appropriate that my DT piece is the card I created for our youngest son whose Birthday it is today...................Happy Birthday Alex. Like me he is a keen Liverpool supporter and I thought this design which I came across on Pinterest would fit the bill perfectly. I have used my Sizzix hexagon die, it's one I bought some time back but not found too much use for it so far, but it works perfectly for creating the football effect on this card. The white section are embossed with Swiss dots, some little banners, a computer generated sentiment and a football button. Again I must thank you all for your kind comments and mails asking how I am, truth is there is still an awful lot going on and to take in and at the moment I don't feel able to open up about it, so please bear with me as in time I am sure I will come to terms with everything. I have gone all inky for this weeks Prickly Pear DT piece, or rather pieces as I have made a set of butterfly cards using a number of stamps all listed above with direct links to them. My background is created by masking the sections I want to colour on the cardstock, applying distress inks to an acrylic block and spritzing with water before stamping the whole block on the Farbiano watercolour cardstock. The more water you add to the blocks the better the inks blend and bleed over the sides to give a more random look. Unless you want your images to pop outside the box as I did for part of the one on the left, do your stamping before removing the masking tape. 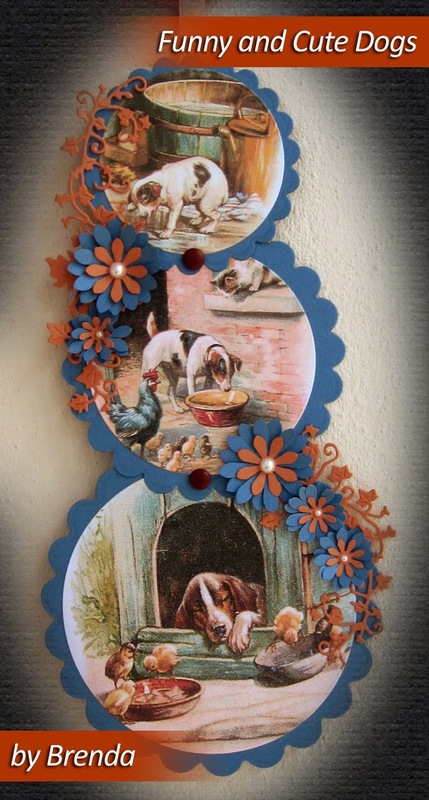 And I have three Nicecrane pieces to share with you after a weekend of some crafty time. The first above uses another of the lovely Dream of Fair Women designs along with Graphic 45 DP's. I printed the image onto some new linen cardstock and am really pleased with the finished result. The one to the left uses three images from Ignacio's new Cute Dogs here, I just love the sleepy dog in the last photo. And finally an Oriental one using the new Japanese designs which you will find here. I thought lilies would go rather well and made two using Ruth's Tonic Punch and Stamp Lily set. 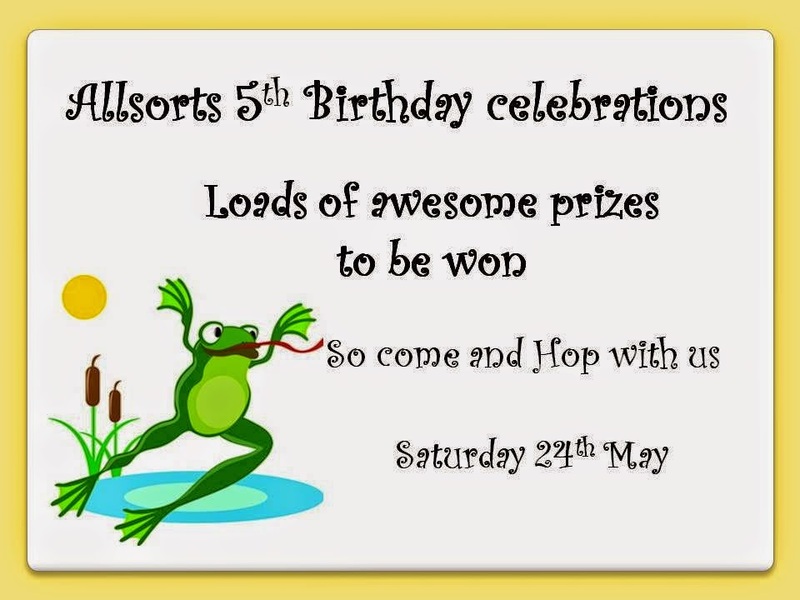 It's our 5th Birthday at Allsorts and we are celebrating !! And we have loads of prizes from Marianne Designs, Crafty Ribbons, Yours and Mine Papercrafts, A Passion for Stamps, FlonzCraft, Baker Ross, Scrappers Delight as well as a prize for the winner of the secret words and a prize from each of the DT form a lucky winners from those leaving comments on their personal blogs. I find it quite amazing that it's five whole years, I have been there from the start and can't quite believe how quickly that time has gone. The fact that we are still going as strong as ever is testament to the wonderful crafters who join every week, not to mention our fabulous sponsors and talented Design Team. So as you might guess we are having a Blog Hop and have loads of fabulous prizes to be won both on the challenge blog and each DT's own blogs. 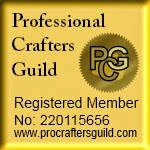 Lots of you know the ropes but there are always new crafters joining us so just to confirm you need to start from the challenge blog here then visit each DT's blogs, collect a letter and leave a comment and hopefully you should have arrived here from Helene's blog and hop next to Wendy's blog. Once you have collected all the letters sort them into two words and mail you answers to me. 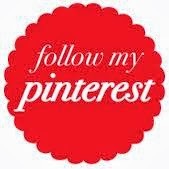 Hopefully by now you know the letter you need to collect from my blog ? Good luck to you all and here is the prize for the winner randomly selected from comments on my blog. It's a scheduled post today so fingers crossed it pops up on time with my Monday Prickly Pear DT card and mid month cards for Penny Black and More and Stamping Sensations. My Stamping Sensations card is some inky indulgence with Dylusions and Glimmer Mist and Timmy's Papillon stamp set, still my favorite of all his stamp sheets which I used along with a mixture of background stamps and a little Frantage around the edges. For my Prickly Pear piece I have used the lovely Cockerel or as they call them in the States Rooster GG0197. As you all know I don't do much colouring but managed to coordinate with the Graphic 45 DP's which go perfectly with the image. My latest package from Baker Ross had some Pebeo paints, tiles, bottles and lanterns and above is what I came up with. I found stamping onto the lanterns a bit tricky due to the shape so I stamped onto some fine tissue paper and then glued that onto the sections and it worked perfectly. The tile on the left has been painted with acrylic pain and then rubbed with gilding wax before stamping with archival ink and the one on the right stamped directly onto the tile using distress markers which I sealed with Slap it On. 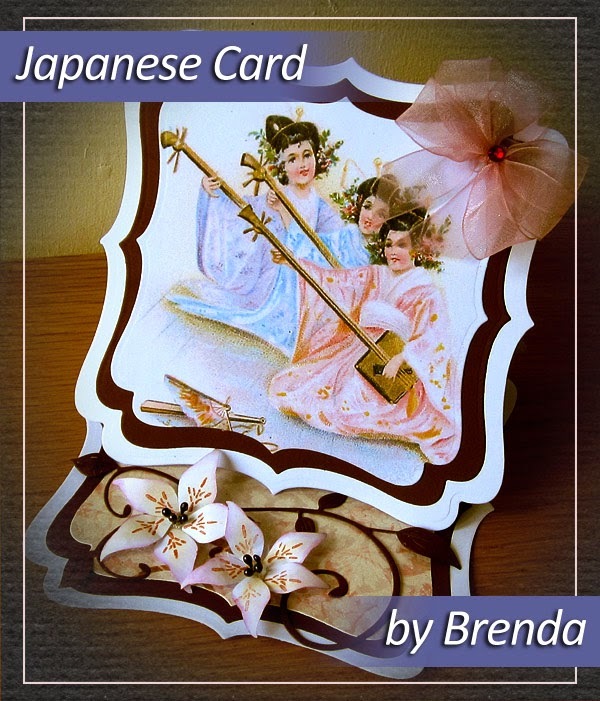 If you are not familiar with the company do check out their web site, their prices really are very competitive and they offer something for both the card maker and those who like a bit of altered art. And finally my PB&M piece using the gorgeous Poppy from the Spring 2014 release called Red Tango, some Kaiser DP's which compliment the image perfectly, liquid pearls and some ribbon. Thanks for popping in, your visits and kind comments are always much appreciated. At Allsorts this week Tracy is indulging us in her favorite colour with the theme of Purple Passion, our sponsors are A Passion for Stamps and Craft Fairy. I decided to go inky and give my brayer an airing and created a background with a masked moon and Adirondack inks, then stamped and heat embossed an Indigo Blue tree stamp, added some Passion for Stamps leaves which I spritzed with Dylusions and Glimmer mist and the lovely Blake poem. It seems my Monday DT shares for this weeks Prickly Pear and Nicecrane DT pieces are all about Ladies and rather elegant ladies at that. First I am going to try and update you as so many have very kindly asked how things are in what seems like a never ending sage and something I am still struggling to accept, much of the time my health issues seem surreal and the 'c' word something I still can't bring myself to say, although I appreciate many go through the same and far worse so don't wish to sound as though I am complaining. I do have a big op scheduled but I have asked to be referred to Liverpool as it's one of only two places in the UK who offer a less invasive form of the surgery on the NHS, less time in hospital and therefore less risk of infection which is important as I am immune compromised. According to the literature they gave me there are only 17 surgeons in the UK who perform 20 or more if this particular operation each year which means it's quite rare and needless to say all but two work in the private sector, that is not a financial option for me hence the request to go to Liverpool. But the NHS wheels move slowly so I have to be patient and they have done their best to assure me this form of 'c' is usually self contained so not to be alarmed by the delays, although that's easier said than done. And another spanner in the works is our holiday insurance...............I am determined I am going on our cruise in August which has been booked since this time last year..............but our usual company declined renewal of our annual policy. I spent ages looking for another until a very kind DT friend sent me some links provided by her partner who works in the industry, for companies specialising in cover for serious illness and we now have a policy in place, so one less thing to stress about. OK, enough negative talk and on to my Prickly Pear piece on which I used this lovely Geisha KK005 image which I coloured with Wink of Stella pens and cut out to stand in front of the floral garden which is stamped with HH0070 Celebrate Spring and HH0044 Flower Silhouette both of which I inked with Distress Markers. The little butterflies are the Mini Butterflies dies D023 which has four in the set. I made the fence from a section of the Cheery Lynn lattice die. The above card is on of a set of three I made for Ignacio using the same basic design which he tells me is one of the most loved Origami folds, I just fell upon it watching a demo and thought how well these A Dream of Fair Women designs would fit this style. All DO's are Graphic 45. 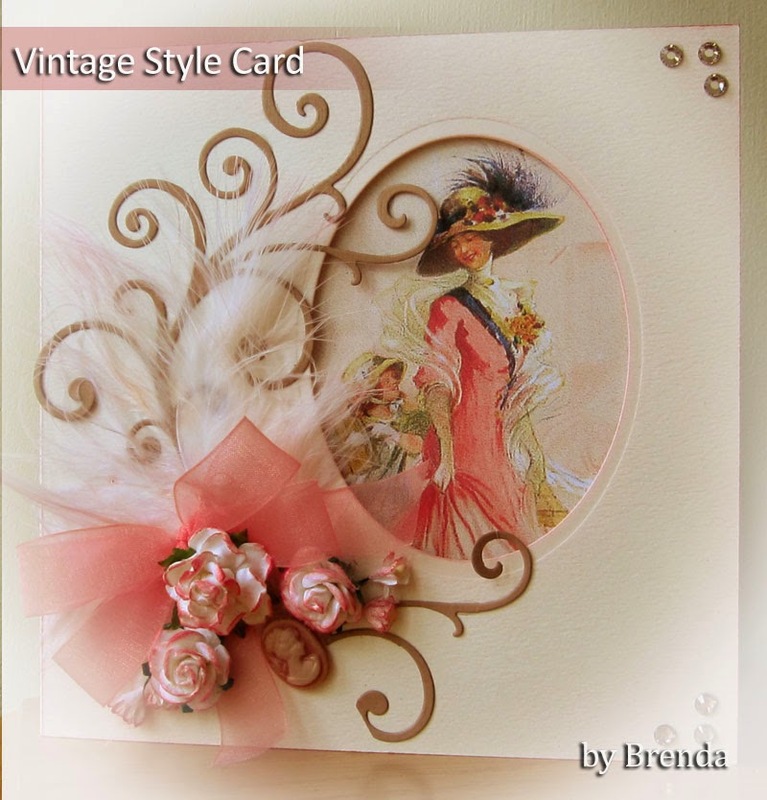 And this one is from the lovely new 'Oh Paris' designs which I placed into an oval aperture cut with a Nestie and added some swirls, flowers and a feather to compliment the ones in the lady's hat. And last but by no means least the lucky winner of my candy which ended yesterday is......................Ellisa........congratulation to you, please mail me with your full name and postal addy. Should I not hear from you by Friday 16th I will re-draw the prize. Note added Tuesday - Ellisa is the winner as published and has been in contact with me. My apologies to Sylvie that somehow the link was wrong, but if you (Sylvie) would like to mail me as I don't find a mail link on your blog, I would like to send you something as an apology for the mix up and your disappointment that someone told you you had won. We are looking for Fancy Folds at Allsorts this week, a theme selected by our very own Wendy. 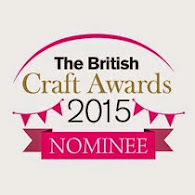 Our sponsors are PPR Papercrafts and Eureka Stamps. Also a heads up that it's our 5th Birthday at Allsorts in a fortnight and as you might guess we are going to celebrate, more details closer to the time but meanwhile here is our Blog Hope logo and we would be so happy if you would grab it for your blogs to help us spread the word. So for my card I used the scoreboard to create the stepper card, stamped the beautiful new Penny Black Hollyhock image and coloured in with Wink of Stella pens and inked a stencil randomly in the background. A computer generated sentiment, some lace and DP from stash. 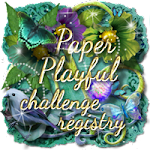 Mr Blogger will hopefully share my scheduled post for my Monday DT shares for Prickly Pear and Nicecrane and FlonzCraft where our May challenge theme is Ribbons and Bows. The top card uses one of the new Nicecrane Children at the Seaside designs, I kept it fairly simple as the image is so sweet and didn't want to detract from it. The one below uses one of my favorite sets from the new Prickly Pear releases, inked the stamped with distress markers to coordinate with the pretty colours of the DP and I masksed the sentiment to use just the word love onto the little tag. And it's another Criss Cross card for my FlonzCraft piece, I am rather liking this shape card and here I have teamed the Flonz image with more Graphic 45 DP's. Have a good Monday Peeps. Another scheduled post so I hope it's Sunday morning as it's time for our new challenges at Stamping Sensations and Penny Black and More where our themes are Anything Goes and well yes........Anything Goes..........oh my goodness I am not sure how that happened but at least it gives everyone plenty of opportunity to combine them together. My Penny Black piece used the lovely Gossamer image which lends itself beautifully to paper piecing which is some of the lush new Graphic 45 Botanical Tea collection..............I've had it since February and it's taken me thins long to cut into it which is crazy really as the 12x12 pad has two of each design. And it's comfort zone stuff for my Stamping Sensations DT piece which is a Birthday Card for blogging friend as today it her Birthday so I am safe to share it. It may seem an odd one for a lady but she like me has a thing for trees, nature and birds so I hope she likes it. I used an oval mask to create a little scene using a mixture of Sutter, Art Impression, Clarity and Inkylicious stamps and Pan Pastels. First of all thank you for all your kind wishes and thoughts, it seems like a never ending saga taking over normal life and the scheduled posts continue as I am now hospital having Sestamibi scans ahead of the op. Our Tracy Mouse has chosen the theme of Butterflies at Allsorts this week where our sponsors are Nicecrane Designs and DigiStamp Boutique. I am thinking this will be a popular one as most of us love our Flutterbys. I have come up with two cards, the one at the top using the TH Cabinet die, lots of inking, grunge paste, stencilling and Nicecrane Butterfly Twinchies. And another of Nicecrane's new designs called French Vintage Postcards which I printed out twice so that I could decoupage the butterflies.